A set of casters can be attached to the bottom of something to make it roll on wheels along flat surfaces. This is particularly useful when large, heavy objects need to be frequently moved. 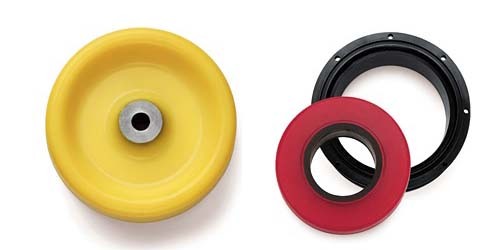 A polyurethane caster is made using urethane wheels instead of regular rubber wheels. This makes the caster more durable and helps to protect it from deterioration when used in a setting where harmful chemicals are present, since polyurethane is highly resistant to chemicals. If a polyurethane caster is being designed for an application where it will not be expected to bear large amounts of weight, the entire wheel will be made out of polyurethane and a small metal bushing will be inserted in the middle so that a bracket can be attached. If the caster is being designed for applications where it will be expected to bear large amounts of weight (thousands of pounds), the polyurethane will only make up the outer portion of the wheel, and it will be wrapped around a circular piece of iron. A shopping cart is an example of one common use of casters. The two casters at the back of the cart are fixed in place so that they can only roll straight forward or backward. However, the two casters on the front can swivel in any direction, allowing the person maneuvering the cart to easily turn it one way or the other. 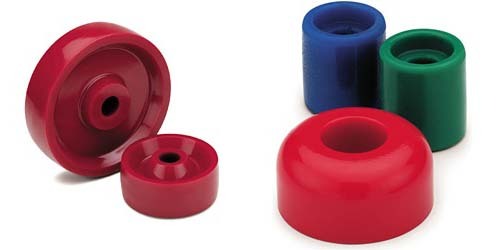 Polyurethane casters are made by filling a heated polyurethane solution into a mold where it is pressed and formed into the shape of a wheel before being treated with heat to allow for curing. The caster brackets are created separately by shaping metal to fit the specifications of the wheel. Near the end of the production process, these parts are joined to create a complete polyurethane caster. These parts are then shipped and sold in bulk to industrial suppliers and customers. Polyurethane Casters Casters are small wheels that are usually attached to an iron center and a steel bracket. Casters are used in a variety of industries and applications; from healthcare to warehouse storage to moving.